We sat down with one of the co-founders of Good Night Theatre Collective to get to know him and his company. Bob Wendland tells us how Good Night began, what they are currently up to, and where they are headed in the future. Bob Wendland: We are halfway through our 3rd season now. It started in the summer of 2016. 4 of us were doing a show at the Community Theatre actually, Mary Poppins. Martha Stai is a co-founder with me, and she played Mary Poppins, and then I played the Butler, like the bubbling idiot butler. Our friend, Ruth Strum played the maid, Mrs. Brill, and then Sydney Place-Sallstrom played several ensemble roles and was the dance captain. And we were having such a good time together, putting that show together. And we started to realize that there was an opportunity in Sioux Falls for more theatre. There was sort of a niche that wasn’t being tapped into. You have Bare Bodkins that does Shakespeare in the Park – and does it very well. You have Monstrous Little Theatre Company that does primarily drama, some comedy, but a lot of it is rooted in sort of modern theatre techniques, and none of it is musical theatre. You have the [Sioux Empire] Community Theatre who does a little bit of everything. You have the Pavilion that brings in a little bit of everything. You have Ephemeral that does some stuff every once in a while. There is a lot of theatre in this town, but I think what we’re starting to find is there’s a place for it. 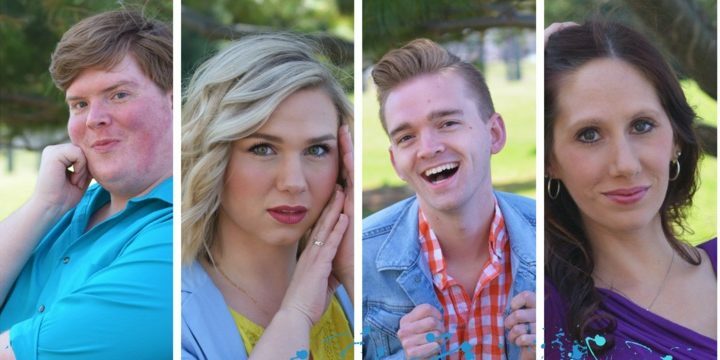 So, over a lot of nights sitting on a porch with cheese and wine (laughs) we started to compile this idea of a professional theatre company in Sioux Falls that specifically focused on musical theatre. To this day we have still only produced, performed, presented musical theatre. Everything that we do has connection to musical theatre in some way. Sioux Falls is incredibly supportive of theatre, and it’s sort of the whole “build it and they will come” mentality. Our audience has really sort of formed itself. We have a lot of people who have been to every show or nearly every show from the beginning, so we have really supportive fans. And I think every time we do another show and pull in a few more people, they stick around because they have such a good time. And I think that’s ultimately what we strive to do is give people a good night. It’s that simple. We want to entertain you through musical theatre, but ultimately, we want you to have fun. So that’s where the name came from? It did, yeah, and actually the name – forming the name is maybe the thing that we spent the most time on, in building our company. ‘Cause instantly the 4 of us connected on collaborating – we want to collaborate with other theatre companies in town, we want to collaborate with businesses and organizations in Sioux Falls, we want to lift everybody up while we’re lifting ourselves up. We wanted to give high-quality performers and entertainers in this town an opportunity to get paid for what they do really well. And we wanted to just build up the theatre community in Sioux Falls, altogether. So, all of that came together so quickly, and then we’re like, OK, well we have to call this something. We have to. We can’t just go and do all of this (laughs) without having a name for our company, and the licenses, and all of that stuff – we have to incorporate. It was probably 3 or 4 meetings – and long, like hours and hours long meetings of writing down words, and doing all of these really silly exercises that we would found on the internet from, like marketing websites and things (laughs). And when that was uttered it was just like: *light bulb* yep that’s who we are and that’s who we’ll always be. And so, the rest is history. So now you have a company, with a name, what was your first venture? The first show we did was a cabaret at Icon Lounge – it was a miscast cabaret, there were four of us in it. Martha, Sydney, and I were in it with a good friend of ours, Maren Engel. So, Maren was our first ever guest artist. And the 4 of us all sang Broadway songs that we would never be cast in. So, I sang a song from Dreamgirls, I sang the ‘Diva’s Lament’ from Spamalot. Martha sang ‘Sit Down You’re Rocking the Boat’ from Guys and Dolls. So, we sang all these songs we would never be typecast in, whether it was gender or age, type, style, etc. And in planning for it, we were all hoping for like 50 people to show up. If we had 50 people come to the Icon Lounge for a cabaret, we would consider it a success and we would grow from there. We had presold about 50 tickets, so we were feeling pretty good about that. And then we opened the doors and there was this line of about 100 people, and so by the end of the night we had sold over 150 tickets to that first cabaret. And that, I think, was maybe – for me, I can’t speak for them – but I think for me, that was probably one of the most humbling moments as a theatre professional that I’ve ever had. Because, you know, we were brand new, nobody knew about us. They maybe knew us on a personal level, or had seen us do something else, like for Bare Bodkins, or the Community Theatre, or DAPA, or anything like that, but they hadn’t seen us as Good Night. And we hadn’t done that much as far as – you know there was no big billboard announcing our company, there was no big news story, nothing like that, we were just sort of sneaking in under the radar; and the fact we were able to get that many people to come to something that had no proof, they had no proof that it was going to be any good (laughs). That was pretty cool, it was very cool. So, your audience showed up mostly based on word of mouth? Yeah, I mean, I think it had to have been. We had facebook, and a little on Instragram and stuff like that, but really it was very grassroots, that’s for sure. It was a lot of “Hey, we’re doing this thing, and you’re a friend of ours, you should check it out.” And then they told their friends. How did you partner up with Icon? I don’t remember if he said the word cabaret, or if he just described a cabaret to us, but ultimately that’s how it started. And we had this agreement that we would do one every month in our first season. So, our first season, we did – from November through June – we did a cabaret every month, and realized that was a lot of work (laughs). We realized that, Carter realized that, and so, in season 2 we did a cabaret about every other month. That’s a little bit of a different thing that we offer too, is that we are performing in… I wouldn’t call it an unconventional space, because in their lounge there’s a stage, and there are lights and a sound system and everything. But when we do our productions, for the most part, we do them in the event hall which is – we do them in 3-quarter round, and we bring in riser seating, and we perform in a little bit of an unconventional way, but we perform these conventional musical theatre stories. We did Last Five Years this fall, and that we actually did do in the lounge, and we did it in run-way style. We had the live band, 6 person band, up against the back wall, and then Martha and I – we were the 2 performers in it – we built this runway theatre that was about 40’ long, but only about 8’ wide. And if you know anything about that story, it’s a timeline – the male character starts at the beginning of their relationship and the female character starts at the end of their relationship, and they’re singing solos until the middle. Then they sing their 1 duet together. and then they start going in opposite directions. It’s a really fascinating story. So, we built this really long stage and performed it in a very unconventional way. And a lot of our audience had never really seen musical theatre outside of a proscenium, beautifully-framed, set pieces flying in and out, kind of style. That’s another thing that we’re hoping we can continue to accomplish, is telling these stories that people have heard before, whether it’s a really well-known musical that you’ve heard before, or whether it’s a brand new musical – ‘cause we do a lot of original work, too – that tells a story that everyone can relate to. We aren’t trying to reinvent the wheel, per se, but we are definitely trying to present musical theatre in a way that people maybe haven’t seen before. Who came up with the runway style stage for Last Five Years? Well, that’s a good question. I think ultimately it became a conversation between myself and Martha, and our director, Luke Tatge. I mean, every rehearsal was the 3 of us, every rehearsal and every production meeting, we were sitting there and collaborating, so it’s hard to pinpoint any idea as being any one specific person’s idea, you know? I did the set design, but based on conversations we had had about the story and about the musical. The set was cardboard boxes that had “kitchen” or “bedding,” you know, clearly people were moving. Because we talked a lot about how these two characters are never settled, in the whole story, they never actually settle down and connect in a relationship, which I think is ultimately why in the end the relationship doesn’t work. (laughs) Spoilers, I guess. But that’s what makes this show so interesting too, is that it opens on the female character, Cathy, singing about their divorce, and then goes right into the male character singing about the first time he met her. It’s just like a very – it’s an emotional rollercoaster. Good Night Theatre Collective started as you, Martha, Ruth, and Sydney, and now is comprised of you, Martha, Kristy, and Luke. Why didn’t you and Martha just take the full reigns? Having a team of 3 other people, who believe in this company as much as I do, and pull their weight in completely different ways, is vital. I am not Good Night, Good Night is not me. Good Night is the 4 of us, and all the actors and the artists that we work with. And I think that’s the key for us, because all 4 of us have full-time jobs, and some of us even have a part-time job on top of that. Martha’s a teacher, I work at the Pavilion, Luke is a creative director at a marketing agency in town, Kristy works for the symphony. We all sort of have our busy seasons at our jobs, so it’s convenient we can plan ahead for our season. We all balance the directing requirements, we all – every once in a while – pop in and perform. We still make sure that 1 of the 4 of us is heavily involved in each of the shows, so that we can have that quality control. Not of our guest performers, because we know that they’re going to be quality – they auditioned for us and they proved to us that they’re high quality already, but the process. The process is so important for us, that it remains open and welcoming and creative. So, yeah, we just balance it. And we know that each of the 4 of us will get a little break somewhere in the year where we don’t have to direct or perform. We schedule rehearsals and meetings early on, so we know what to avoid. It’s balance, and balance is tricky sometimes. But having 4 people on the team is key, absolutely. And then, all 4 of us have a role in our company too. So, I’m the artistic director. I make all the decisions about… creative, basically. I work with all the creative talent, with our lighting designer and our set designers when we pull them in. And I do all the season selection – now with that said, I mean, the rest of the team certainly weighs in. I say “Hey, I’m thinking about this,” and they’re like “oh, I love that idea,” or “ Bob… you’re a little too ambitious” (laughs). Martha is our company manager, so she manages the people. She does auditions, and does all the communication with our guest artists on that end. Kristy is our executive director, so she does the business side of things. The numbers and all of the boring stuff that my creative brain could never wrap around anyway – paying the taxes, balancing the budgets, all that stuff. And then Luke does all of our marketing, which is great, because that’s what he does for a living (laughs). So, yeah, that sort of innately balances it out for all of us, because then we know what we’re expected to do 365 days a year, 12 months a year, 7 days a week. Speaking of auditions, is that how you cast your shows? In our first season, I think the only guest artist who didn’t formally audition for us was Maren. And Maren will always have a special place in our company, ‘cause she signed on to take a risk with us in that first show, not having any idea what we were going to be doing. So, Maren Engel was our first Collective Member, but then the rest of the season, that first season, I think we cast 7, or maybe 8, additional people for the January, February, March, April, May, June cabarets. At least 1 of the 4 of us was always in it, and at least 1 of the 4 of us directed it each time, in that first season. Because we wanted to make sure that the formula we had down actually worked before we pulled in other directors, or before we did a show with 4 brand new people. ‘Cause that was – and still is – really important to our process, is that yes, we’re going to pay you, but that doesn’t mean we’re OK with giving you a bad experience. We want you to feel comfortable, we want you to have a – to be creating in a safe space, basically, where you can feel like you can get a little crazy and you feel like you can take some risks with us to create a really entertaining show. So, outside of Maren, everyone has auditioned and certainly a lot of the people that have come to auditions have been people we’ve worked with in different theatre companies in town or people we actually work with at our day jobs. But it’s been fun to have people we’ve never met, or some people we’ve never even heard of, show up to auditions and – you have to sing 2 songs, it’s a pretty laid-back audition. We ask you to sing a musical theatre piece, and a contemporary pop/rock/country piece as well, so we can sort of see what your range is. Because in a cabaret when there are only 4 people and you’re singing 20 to 30 songs, we’re asking you to have some range. You know, we’re asking you to sing something that’s maybe a little more dramatic and then sing something that’s really ridiculous in a character style that’s really over the top. And it’s been cool to have these people sort of come out of the woodwork, and show off their talents in that way. 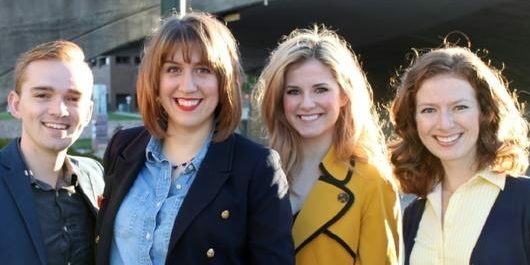 At the end of this month we have a cabaret featuring 4 women. And 3 of them are returning performers, and 1 of them is a coworker of mine, actually, who I knew could sing, but until she showed up at auditions, I had no idea how incredibly she could sing, (laughs) and how entertaining she is. And it’s been fun throughout the rehearsal process to see her, not only be very musical and an incredible vocalist, but see this entertainer aspect come out of her, and the characters that she brings to life, and how funny she is. Yeah, she’s a show-stealer for sure. I think some people are maybe intimidated by doing a full-staged, big huge production at… you know, anywhere in town. And so, I think what’s nice about the cabarets is it offers people this opportunity to perform and to entertain in a really… sort of low-risk atmosphere. You know, you’re just singing some songs in a bar, with a bunch of people who are there just to hear some songs, in a bar. There aren’t incredible set changes, and you’re not doing a million costume changes throughout, there’s not hours and hours of choreography to learn. And so, it’s a fun way to sort of let some of those people who maybe don’t have the time commitment for a 3 month rehearsal process to jump in. It’s about a month – maybe a little bit more – of rehearsals. It comes together really quickly because we work with the most talented people in town, and then you get these two nights of really fun performances you get to do. It’s interesting – we have learned a lot in 3 and a half seasons (laughs), so it’s interesting to think about how we rehearsed in that first cabaret versus how we’re rehearsing right now when we’re in the middle of this cabaret. Our first cabaret was a lot of solos, it was a lot of the 4 of us just singing a solo and then going and sitting down at the back of the stage. So it was a little bit more of a… looking back at it, it was a little bit more of a vocal recital almost (laughs). And I think people had fun, and it was unexpected, ‘cause nobody knew what to expect (laughs). But now, like this one that we’re doing right now, it’s hard for them to rehearse without all 4 of them, because even if it is a solo number, you have 3 people backing you up on harmonies and other vocals, or choreography or whatever, so we’ve added a lot of layers to it since fall of 2016, when we did our first cabaret. But the rehearsal process… I would say it’s pretty casual as far as rehearsal processes go. We don’t have our own company space, per se, so a lot of times our rehearsals are in my living room or in Martha’s living room (laughs), and when we start to put it on its feet and add choreography and things, we just push the furniture out of the way. We do have some rehearsals at the Icon obviously, leading up to it, but that usually doesn’t happen until the week before or the week of the event. With our actual musical productions, that’s a little different. We do take a little more time on those. And we find other spaces, like open spaces we can use to do choreography and music rehearsals, so we have an actual piano, and we’re not just finding an app online (laughs) to plunk out notes and stuff like that. It’s a pretty casual, laid-back process for rehearsals across the board. For us, it’s really important I think that we continue to – because our model is so professional, we are starting to be in every sense of the word, a professional theatre company. We pay our performers, we pay our artists, we pay any of the technical people that we bring on, our choreographers, directors, etc., ect., we pay everybody. So that the expectation of professionalism is just – it’s already there. It certainly helps that the people we work with are… just incredibly talented, and you don’t really have to pull a lot out of them, it’s already there – but that additional layer of “you’re going to get paid, we’re doing this in a real venue, and we’re providing you with the costumes that you need and the set that you need,” and everything like that, we just really don’t have any issues with people rising to those expectations every time. What does Good Night have coming up? We have another original musical that we’re premiering in April, it’s called “Daytime: A Soap Opera Musical.” It’s set in the 80’s, and the plot revolves around a failing soap opera. They’re sort of on their last legs, no one’s really watching any more, and the cast – it’s a comedy, clearly (laughs), if you haven’t put that together already, but the cast is… it’s 8… I would call them caricatures, because they’re so over the top and really ridiculous. And they’re all sort of trying to out-do each other to come up with the solution for them getting booted off the air. Some of them are trying to improvise on camera and steal the scene and do something really over the top, and others are trying to appeal in a more direct way. That one will be very fun. I’m looking forward to starting that one. We start basically right after we’re done with rehearsals for the January cabaret. And we actually got a grant from the South Dakota Arts Council. Luke actually wrote it, and he got a grant from them, so we’ll be doing a studio recording of the music for that, too. So, yeah, we’ve got a lot of irons in the fire for that one – a few local businesses that we’re working on partnering with and things like that. So, that one will be fun. 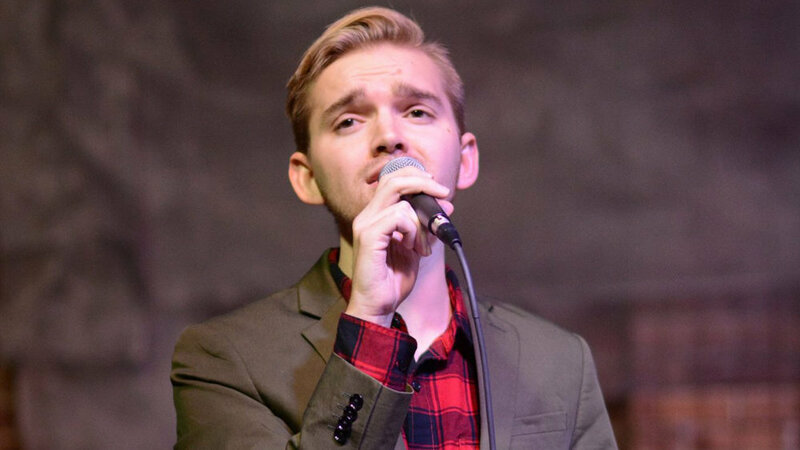 Our last cabaret of the year is in June, and it’s “Dude’s Sing the Diva’s” cabaret. There are 4 guys in it and we’re all singing songs made popular by women in the rock and pop and country genres, so, it’ll be a pretty goofy night (laughs). And then we’ll announce our 4th season which we’re working on all the details for now, and super excited to announce that in June. In choosing your shows to create the season, is there a formula you follow? We are certainly remaining open, because that was how our business model was founded, on this idea of open hearts, open minds, open eyes. Whatever is out there and whatever comes our way, we’ll certainly think it through and make sure it’s a good option. So, we’ve had a few inquiries, honestly, over the last few months of people from all over the country sending musicals that they’ve written, and asking us to sort of give them pointers. Which is also very humbling, to think that we haven’t even finished 3 seasons, and we already have people from coast to coast sending us their work and asking us to critique it. But I think there will always be a place for cabarets in what we do. That’s how we started. Those are our roots. They’re… usually pretty easy to put together, and like I said earlier, it’s a great way for people who can’t commit to a long process, but are still just as talented as anybody else who can. It’s a great way for them, to sort of, whet their appetite on musical theatre. Original musical theatre is super important to us, so as long as the resources are out there for that, we will continue to produce original musical theatre for sure. And this year was the first season that we did a non-original show, Last Five Years was the first non-original musical that we did. And I think we’ll absolutely find space for that moving forward, we found that it was really fun to tell a story that’s been told many, many times in our way, you know, with our spin. The people at our table are creative, and intelligent, and talented, and so it’s fun to take a show that people have expectations – you know, you go into the theatre, whether you’ve seen it a million times, or you saw the movie version of it, or you’ve read the script, or you’ve heard the music on Spotify – you go in having this expectation of how it’s supposed to be told. It’s fun to get to take something that’s been done so many times, and rebuild it from scratch in our way, with our take on things, and with our specific talents and ideas brought to the table. But I also don’t see us venturing away from musical theatre really any time soon. There are really, really talented people in this town already doing all of that. You know, Jayna [Fitzsimmons] and Bare Bodkins do Shakespeare better than anybody else. And Monstrous does incredible, dramatic portrayals of scripts that are old, or new, really. Their version of No Exit last year was incredible, and I’ve seen that show so many times. I wouldn’t say we are trying to challenge our audiences in a way that some of the other theatre companies in town are, like pushing the envelope and making you think about how you believe in things or how you evaluate things. Which I think is great, I love that theatre has the power to do that. That’s not really our style – yet, maybe it will be, someday – but right now we are very much focusing on presenting musical theatre in a way that people can get excited about, and just have a good night, have a good time at the theatre. So, yeah, I think we’ll definitely stay in our little avenue, and when the opportunity presents itself to – you know, 15 years from now when Something Rotten is a show that we can do, we’ll partner with Jayna and Bare Bodkins, and we’ll do something really fun in that avenue. But for now, musical theatre is where we’ll be. You said earlier “I am not Good Night,” so tell us about Bob! How did you get where you are today? I grew up in Arlington, SD, which is a tiny town of about 900ish people. And… from a very early age I started performing, singing, acting in the very rare occasions that I could (laughs) in a small town. In middle school, I started doing shows at SDSU in Brookings. There was a teacher in Arlington who lived in Brookings, so every day after school she would take me to SDSU, and then my parents would pick me up after rehearsal. So, a lot of my, sort of formative years as a performer were spent at SDSU as a Jackrabbit, which is a little bit embarrassing because I went to Augie (laughs). So, I certainly don’t affiliate myself with SDSU anymore, but the theatre program there was so strong and they really cultivated that spark in me for theatre and for creating, for storytelling in that way. Then in high school I did the One Acts, and the all-school plays. I did 4-H Performing Arts in the summer, because, again coming from a small town, that was about the only summer opportunity I had (laughs). And then my junior year, we did job shadowing, and I job shadowed with someone at KSFY one day, and then with a professor at Augustana the second day. Both of them were very eye-opening to me. The first day when I was with KSFY, I realized almost instantly that I could not be a news reporter (laughs), just the pace of it, and how intense – like I have great respect after that day for people who work in the news media, television news media, because, instantly, I was like “this is overwhelming…I can’t do this!” (laughs). The pressure that’s on them to tell these stories authentically… yeah… so… that was very eye opening. Then the next day I went to job shadow a theatre professor at Augie, and that was – I mean, the students there and the professors there, within the 4 hours that I was there, just sort of instantly made me feel welcome and like this was my place. And that being surrounded by creative theatre people was what I wanted to do every day of my life. So, then I went to Augustana, got a theatre degree and a communications studies degree, and then the summer I graduated I got a part-time job with the Pavilion doing their theatre summer camps. And it was very much like, “this is my part time job, I’m going to do it for the summer,” and then we were planning on moving out to the east coast actually. And… I don’t know if it was destiny or just happenstance, but a job opening – a job became available at the Pavilion running their entire camp and class program there, and I applied and I got it. So, for… I don’t know, 2010, 11, through… 2017 (laughs) so for those 6 years, I was running the Dakota Academy of Performing Arts, which is the theatre and chamber music program there. And I loved that – that job was… I mean I will always have a very special place in my heart for that job. Going into it, I was a little petrified… by this idea of stage parents. And how like – you know, you hear about stage moms and stage dads and how it’s like – I had no idea how I was going to manage that. And I don’t think I had one instance in all 6 years of a stage parent. The people working in that program – on every level – the employees and the kids themselves and the families are just the most supportive and encouraging people you will ever find. I did that for a long time, and then just last year – basically a year ago – I took a new position at the Pavilion, helping to book the Broadway shows and the concerts and everything that happens there, so now I am… my title now is Manager of Performance and Events. So, I do that every day at the Pavilion now, which sort of opens my calendar up a little bit more in the evenings to work on Good Night and to perform and create my own work as well. And still get to support my kids at the Dakota Academy of Performing Arts when they have a show. Go and watch them… and it opens it up for me to go and see them in other things too. 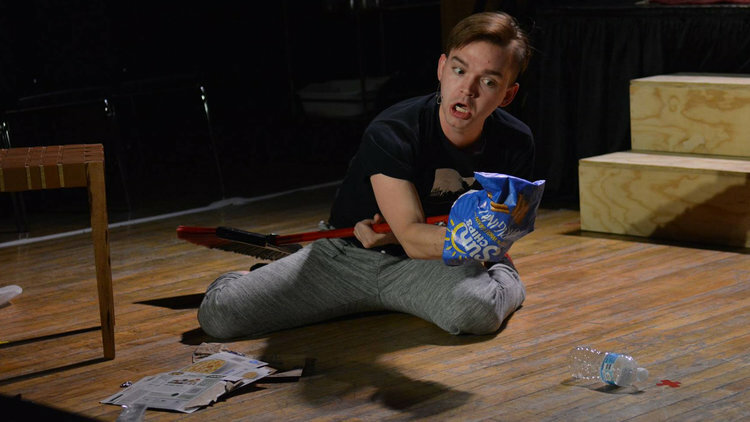 When I was running DAPA, I really didn’t have – it’s kind of funny how when you are running a theatre program, you don’t have time to see other theatre (laughs). And so all of this stuff is happening in your community around you, and you want so badly to be there and to support it, but that’s the other thing that’s so great about Good Night, and about having 3 other people on the team, the 4 of us… and we do this thing every month called “Good Nights with Good Night,” we’ll pick a different theatre company and we will go see their show. This month we’re going to the new Improv Falls group, they’re doing a show on Thursday, so we’re gonna go and see their first show ever. Last month we went and supported DAPA. We’ll go to the Community Theatre in February and see Steel Magnolias. We go to Olde Towne Dinner Theatre, we go to USF and Augustana stuff. It sort of forces us to not get bogged down with only our stuff, because there is incredible theatre being created in this town on every level. I mean, you can go to a Eugene Field musical theatre show once a year, and be just blown away by what those elementary students do. The high schools have incredibly talented kids in them. The colleges have really strong theatre programs. And then all the professional and community theatre level stuff that happens… it’s good and it’s unique. Everything is very different. You know what you’re gonna get when you go to the Community Theatre, you know what you’re gonna get when you see a Monstrous show… and I think that’s cool. I think it’s cool that everybody has sort of found their niche and their audience. And then because it’s a tiny big city, all of those audiences talk, and then you know, our people go and support Monstrous people, and Monstrous people come and support our people. It’s a cool time to be creating theatre in Sioux Falls, because the community is supportive, the artists are supportive, it’s…it’s just fun, it’s very fun. Was there a person or a show growing up that was most influential for you in finding your passion for theatre? It sounds cliché, but I would definitely say the mentors that I had were my parents. My dad did community theatre in a neighboring small town, like one or two times a year, so as a very young kid I was watching my dad on stage doing this thing that he really enjoyed, and I think that sparked it in me before I really understood what theatre was (laughs). So, yeah, my mentors were definitely my parents, they supported me in every endeavor, theatre or otherwise, and I think that sometimes that is a hard narrative to find. The first role that I got in something more than just a school play in elementary, was I played Winthrop when SDSU did The Music Man, for their Prairie Repertory Theatre, in… oh gosh, the 90’s, late 90’s or early 2000’s. I was a middle schooler and did that role, and had the time of my life. There were like 15 kids cast in that show with these college students, and the college students were amazing mentors for us, and super cool – ‘cause when you’re 11 years old and you’re working with 21, 22 year olds, it’s like… a big deal, they are celebrities (laughs). That was probably the first formative experience I had that really opened my eyes to like, people go to college for this, and people choose a career in this, and they make a living… and you don’t have to be Tom Hanks to be a professional artist. Someday I would love to be in that show again, and play Harold Hill, or really any of the male adult roles, because all the roles in that show are so fun. Good Night probably wouldn’t — ? Yeah, (laughs) it will be a very long time before we venture down that path, for sure. But that’s the fun thing about having a company like this, too, is that there’s nothing really off the table for us right now. If we were to take on The Music Man, we would certainly have to tell it in a different way, you know, we would have to get creative and… go down that avenue in a completely different way (laughs). But the option is there, and it’s exciting to be on a team – not only with myself and Luke and Martha and Kristy, but with all of our guest artists – it’s exciting to be on a team that is excited about and open to challenge. And wants to get creative, and wants to problem-solve, and wants to bring something new and innovative to the table. It has been a crazy four years, since we first had this idea over a glass of wine… or like 2 or 3 glasses of wine, and some fancy cheese. I will always believe that everything happens for a reason, and I think that the 4 of us were in that show together at that time in our lives, with our minds open just enough to realize that there was this tiny little spot in our community that wasn’t being accessed by artists or by theatre professionals, and we tapped into it and I think the rest is history. And it’s exciting to think about where it will be in four years, and in four years from there. 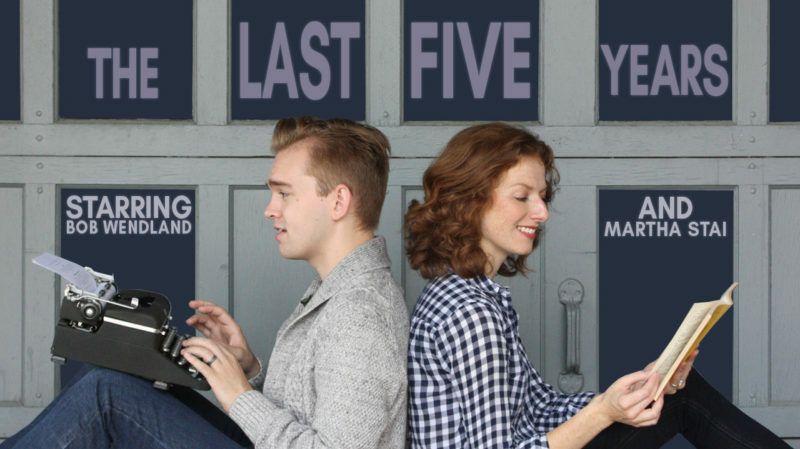 You don’t have to wait 4 years to get in on the fun of Good Night Theatre Collective. 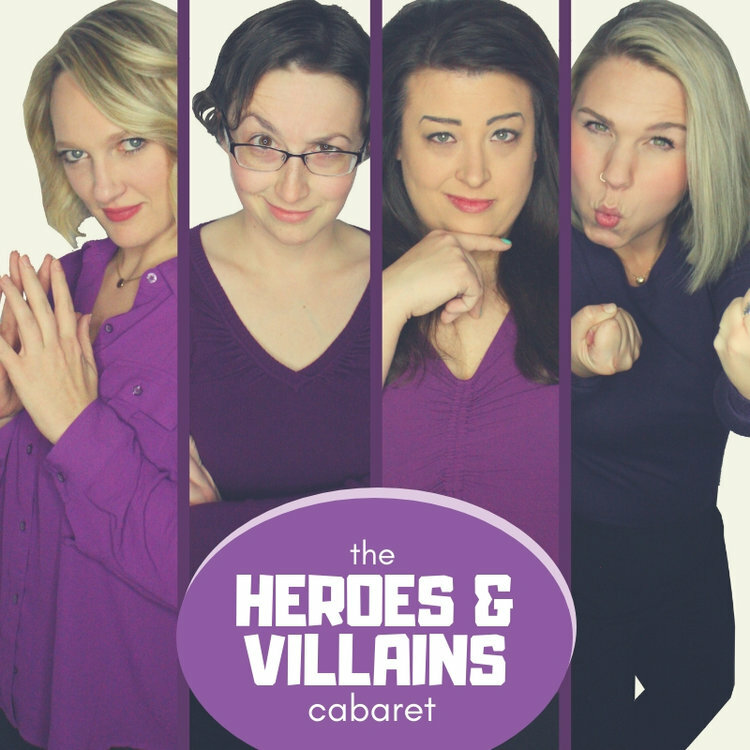 This Thursday and Friday, they present The Heroes & Villains Cabaret at the Icon Lounge. Choreographed by Bob Wendland, Directed by Luke Tatge. Get your tickets and get ready to have a good night!